Danmark Ø („Denmark Island“, greenlandic: Ujuaakajiip Nunaa) lies on the southern side of Milne Land at a fjord crossing. To the east is Hall Bredning, the wide-open middle part of Scoresbysund. To the south is the opening of Gåsefjord and Fønfjord, the windy waterway into innermost Scoresbysund, starts directly west of Danmark Ø.
Danmark Ø is a roughly square-shaped island, more than 15 km across and with many rocky hills up to 380 m high. The glacial origin of the landforms is pretty obvious, some slopes are very steep, but the hills of ancient gneiss are mostly rounded and spread erratic boulders make the origin of these landforms very clear. There is a small, shallow but well-sheltered bay at the southern tip of the island called Hekla Havn. It provides good anchorage for small boats and yachts. It was here that the ship Hekla of Carl Ryder’s Østgrønlandske Expedition wintered in 1891-92, and on this occasion, both the island and the bay got their names. During good weather, which is not uncommon in inner Scoresbysund, the views from the hills of Danmark Ø to the landscape in near and far distance are really great. The difference between the gneiss landscapes to the north and the basalt country to the south are obvious even for the untrained observer. The basalt shows clear stratification, which the older gneiss does not have (not because it is older, but because it is a completely different kind of rock). The transition is nicely visible at Gåseland (the peninsula between Fønfjord and Gåsefjord), as you look southwest from Danmark Ø, where the older and accordingly deeper seated gneiss is covered by basalt layers. Further south, the gneiss disappears below sea level. On Danmark Ø, you can admire the gneiss, the ancient geological basement of this region, from close distance with all its beautiful little features, from foliation to small dark intrusions and amphibolite lenses (old, deformed basaltic intrusions). 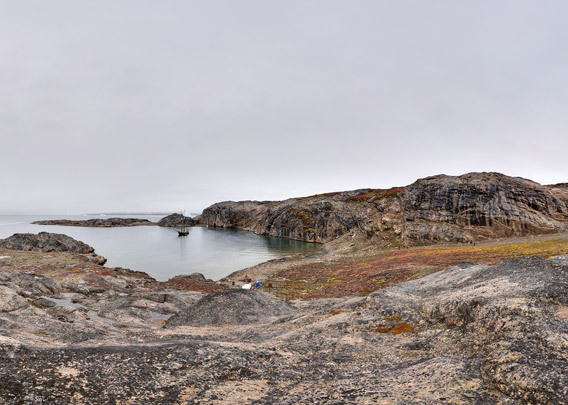 During a visit in September 2013, when I made these panoramas, the weather was less favourable, and the views and photos taken on that day don’t do the usual splendor of the scenery justice. Well, next time! 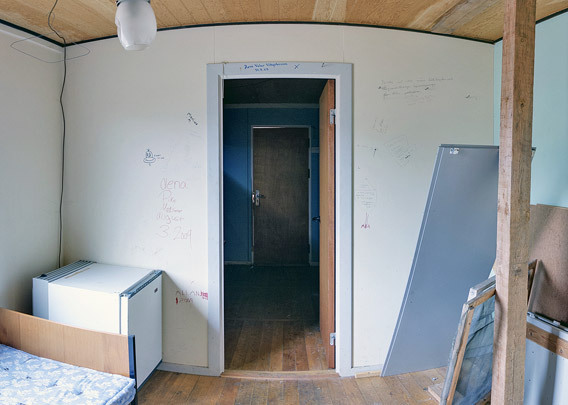 But for the time being, there are some inside panoramas of the spacious hut at Hekla Havn, which is still often used by local hunters and expeditionists from elsewhere. Erich Flintsteiner (?) / Ing. 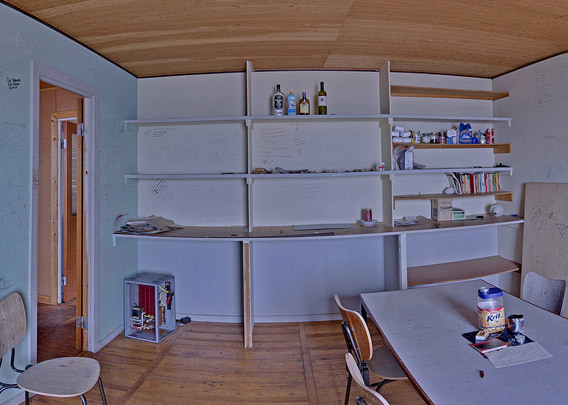 In diesem Raum haben sich neben zahlreichen Einheimischen u.a. der alte Grönlandfahrer Peter Fabel mit Begleitern (2006) sowie ein Team des NDR-TV/Nordsee-Report mit Peter von Sassen und weiteren (August 2006) verewigt.